There seems to be an increased focus on the alarming Texas peyote situation. A couple of weeks ago the Houston Press published a mournful, in-depth article on the vanishing peyote populations and the implications to the Native American Church. The article features interviews with two (out of three remaining!) peyoteros, Mauro Morales and Salvador Johnson, describing their increasing problems in finding peyote due to root-plowing, over-collection and fencing of land for hunting. "There's some medicine, right there," he [Mauro Morales] says. It's a lone peyote button, about an inch in diameter, way too small to harvest. It'll be another five years before this peyote is mature. As he navigates the hostile flora, he points to three more small peyote plants, all of them too young to cut. "I used to collect as much in a week as I now do in a month," he says. "I don't know what's going to happen to the medicine." Morales almost never utters the word "peyote." For him, the small green-gray cactus is a sacrament with miraculous healing powers, hence his word for it: ­medicine. What makes peyote different from just about any other cactus in the world is that it naturally produces mescaline, a psychedelic alkaloid that can induce hallucinations lasting for days. To protect against poachers getting in and deer getting out ranchers are increasingly fencing and patrolling their grounds. The ranchers' hands-off policy represents a dilemma for Martin Terry, the world's leading authority on peyote. On the one hand, protection against peyoteros will conserve the cactus. On the other, it prevents Indians from getting access to their sacred plant. "From the point of view of the plant, the only threat is overharvesting," he says. "The fences and personnel that protect ranch lands from would-be harvesters are the very opposite of a threat, as the protected populations of peyote inside those fences are the only healthy ones in South Texas." Still, Terry is sensitive to the peyoteros and their way of life. He considers Mauro Morales a personal friend. He wants to make sure that Indians have access to their cactus, but that's getting harder and harder. The whole situation seems more and more like a gordian knot in dire need of a bold solution. 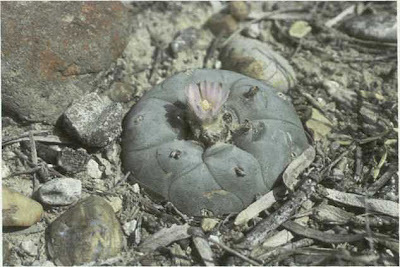 The available natural peyote populations in Texas are over-harvested and not given time to replenish. At the same time many NAC members are opposed to cultivating the plant. One possible solution could be to import peyote from Mexico where the plants are still plentiful; but that might at the same time export the peyote conservation crises! You can read more on the Texas peyote situation in these posts: The “Peyote Gardens” of South Texas: a conservation crisis?, Troubled times for Texas peyote harvesters, and In Deep South Texas, peyote harvest dwindling. The "Peyote Gardens" of South Texas: a conservation crisis? More than a quarter of a million Native Americans use the peyote cactus (Lophophora williamsii) (Fig. 1) as a sacrament in a Pan-Native American religion called the Native American Church. This bona fide religion includes Native Americans from throughout the United States and Canada. Almost all of the peyote consumed in their ceremonies comes from the "peyote gardens" on the Mustang Plains in south Texas, which has been carefully documented by Morgan (1976, 1983) and by Morgan and Stewart (1984). Federal and Texas laws permit the collecting and use of peyote by Native Americans in their religious ceremonies. Fig. 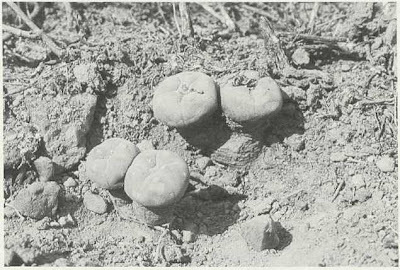 1 - Peyote (Lophophora williamsii) in habitat on Las Islas Ranch, Starr County, Texas. The origins of the Native American Church are complex, and the reader can refer to detailed accounts of how the modern peyote religion arose in the late nineteenth century through the influences of traditional Native American ceremonies and Christianity in both Mexico and the United States (Anderson, 1980; Stewart, 1989). This paper describes the long relationship of Hispanic "peyoteros" in south Texas and members of the Native American Church, as well as the impact of many years of collecting peyote tops or "buttons" within the Tamaulipan Thorn Shrub vegetation. 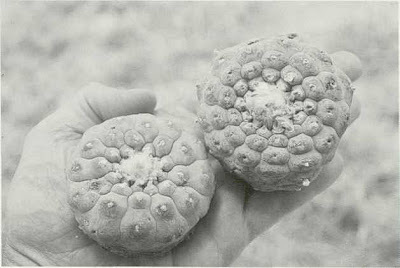 Many report that the peyote populations are greatly diminished in size (Morgan and Stewart, 1984; Jerry Patchen, pers. comm. ; Salvador Johnson, pers. comm. ; Jackie Poole, pers. comm.). Is the continued collecting of the plant for religious purposes leading to a serious conservation problem? Will peyote continue to be available to Native Americans in the foreseeable future? Fig. 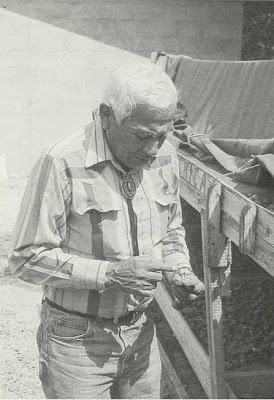 2 - Amada Cardenas, an Hispanic peyotero, who has collected peyote for Native Americans since 1933. Hispanic peyoteros and some Native Americans have harvested peyote within this region for more than 100 years. Until the 1960's the main area for collecting the plant was in the more northern part, mostly in Webb County in the vicinity of Mirando City. In fact, the first peyoteros worked out of a small community just to the south of Mirando City called Los Ojuelos. Abandoned many years ago, the small town is now being rebuilt. Hispanic peyoteros and Native Americans developed a strong relationship, which has persisted to the present. The home of Amada Cardenas (Fig. 2), who is the oldest living peyotero, is located at the edge of Mirando City. It has become an important religious site for Native Americans who visit the area, with peyote meetings held in either a hogan or tipi. 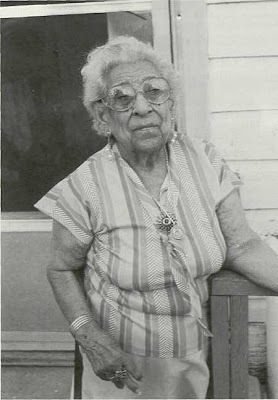 Amada, now 90 years old, was born in Los Ojuelos and became a peyotero in 1933. She is known to most Native Americans as "Mom"; often she provides Road Chiefs (church leaders) with especially fine specimens of peyote (Fig. 3) to serve as "Father Peyote" in the ceremonies they lead. 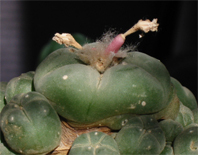 Peyote growing in her garden is also highly revered (Fig. 4). She and the other peyoteros in the northern part of peyote country primarily sell dried peyote. More recently, peyoteros have operated in the more southern area around Rio Grande City; they deal mainly in fresh or "green" peyote, but dry some as well. Fig. 3 - Especially large, fine peyote tops, which will be used as "Father Peyotes" in religious ceremonies of the Native American Church. Fig. 4 - Peyote growing in the garden of Amada Cardenas. Note the coins and corn-husk cigarette butts that have been left as "offerings." Peyoteros must be licensed by the Texas Department of Public Safety and the Drug Enforcement Administration (DEA) of the federal government, paying annual fees of $5 and $400, respectively (Salvador Johnson pers. comm. ; Jerry Patchen, pers. comm.). They must keep accurate records of how many pieces of peyote they harvest and sell each year. 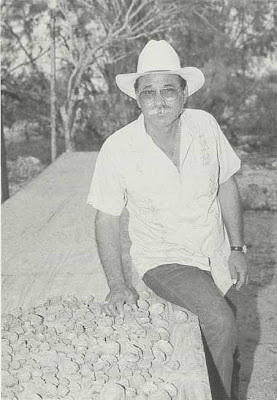 Responsible peyoteros lease the rights to collect peyote from the land owners, a typical lease costing $800-1000 for permission to work on a small ranch for 30 days (Salvador Johnson, pers. comm.). Leases for ranches of several thousand acres would cost far more. Unfortunately, a few peyoteros fail to secure permission to collect on private land, thus causing land owners to become angry because of their trespassing. Illegal trespassing was a particularly bad problem in the 1960's and 1970's when non-Native American "hippies" or members of the drug cult came to south Texas to search for peyote. They would often camp illegally and have extended drug parties on private property. Their illegal trespassing, coupled with their association with more serious drugs, caused many ranchers to close their lands to everyone, including peyoteros and members of the Native American Church. These "hippies" have not returned in recent years. Fig. 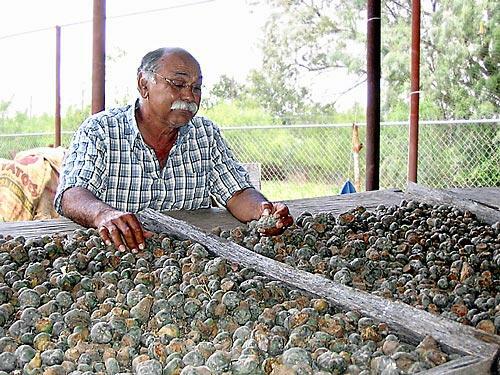 5 - Salvador Johnson, who has been a peyotero for more than 30 years, with drying peyote "buttons." There are currently 11 peyoteros working in south Texas. Each harvests and sells about 200,000 tops a year (Salvador Johnson, pers. comm.). However, productivity varies from individual to individual, as well as the season of the year. For example, no one collects during Texas's hunting season, for it is far too dangerous to wander through the brush harvesting plants, with hunters searching through the thick brush for the numerous white-tailed deer. One peyotero, Salvador Johnson of Mirando City (Fig. 5), has been in the business for more than 30 years. He works throughout the northern region of the cactus's distribution in south Texas, an area of 200,000 to 300,000 acres, and collects more than 300,000 buttons or tops a year. He claims that he and four other workers can collect about 30,000 heads on 25 acres of land in about 5 hours — if the plants are abundant. It takes 10 days to dry the buttons (Fig. 6), for which he charges 15-17 cents a piece. The size of the buttons makes no difference with regard to price, for both state and federal laws are concerned only in the number of pieces collected and sold. Thus, Salvador is able to charge $ 150-170 per 1000 dried buttons, plus $5.00 per 1000 for shipping. The price for dried peyote has steadily risen. In 1966 the cost was $15 per 1000 buttons, but it had risen to $80 per 1000 by 1981 (Morgan and Stewart, 1984). Thus, the price has doubled in the last 10 years. Fig. 6 - Freshly harvested peyote tops that are being dried for sale to Native Americans. Anthony Davis, also known as White Thunder (Fig. 7), is an 83-year-old Pawnee Road Chief and President of The Native American Church of the United States in Texas. Anthony, a longtime member of the Church, says (pers. comm.) that the annual demand by all branches of the Native American Church in the U.S. and Canada for peyote "buttons" is 5-10 million. Unfortunately, the peyoteros of south Texas come far short of reaching this need. If they were to harvest that many tops, what would be the longterm effects on the natural populations? In fact, what is the impact of their present collecting of about two million tops each year? Fig. 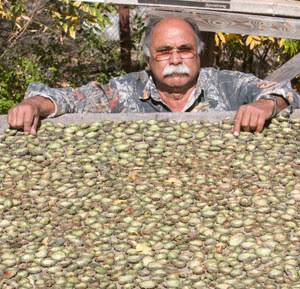 7 - Anthony Davis, a Pawnee Road Chief, examining drying peyote "buttons." I visited a population of peyote on Las Islas Ranch in northern Starr County. The ranch is presently closed to outsiders, including peyoteros, with numerous high fences and locked gates. The area we visited had never been root-plowed and consisted of natural vegetation (Fig. 8), with heavy stands of mesquite and other native shrubs. No peyoteros have been on the property in more than three years. I examined numerous plants and found about half had been previously harvested. The usual technique for harvesting is to use a flat, short-handled shovel or machete, which is carefully pushed just beneath the soil to sever the top of the plant from the tuberous root system. If the top is removed at ground level, regeneration is rapid, usually with one - or more - heads arising from the original root system (Figs. 9, 10). New tops will sprout in less than two months if the plant is in a state of active growth. 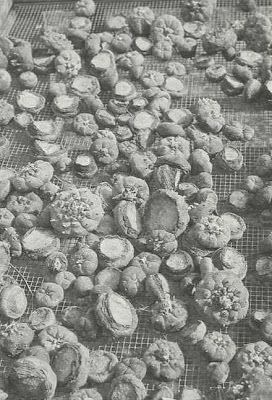 The Las Islas site had many peyote plants with one or more small heads, most less than 5 centimeters (2 inches) in diameter. Several large individuals were found growing under large mesquite trees. Peyote seems to be remarkably resilient if proper harvesting techniques are practiced by peyoteros. Fig. 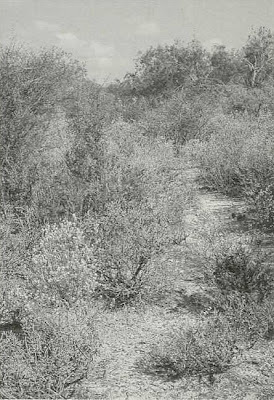 8 - Natural habitat of peyote on Las Islas Ranch, Starr County, Texas. Fig. 9 - Cluster of small peyote tops. Fig. 10 - Soil removed to show that the tops arise from a large root system from which a top had been removed several years earlier. Fig. 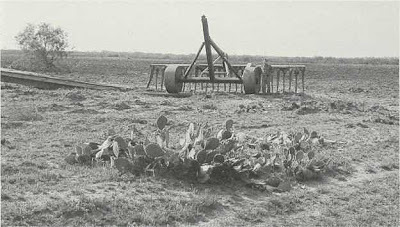 11 - Root-plow (note man standing beside it), with Opuntia engelmannii in the foreground and the newly cleared area behind. In recent years ever-larger numbers of Native Americans are coming to visit the "peyote gardens," which are almost totally on private land that is fenced and posted. Some Native Americans resent being prohibited from visiting sites where their most important "medicine" grows, thus creating serious tensions between them and the ranchers. 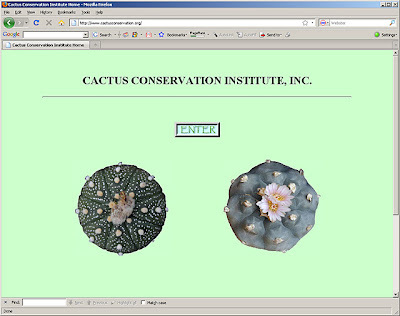 exception of Opuntia engelmannii (Fig. 11). It multiplies rapidly by vegetative means once the ground is disturbed and in many places it forms nearly impenetrable thickets. 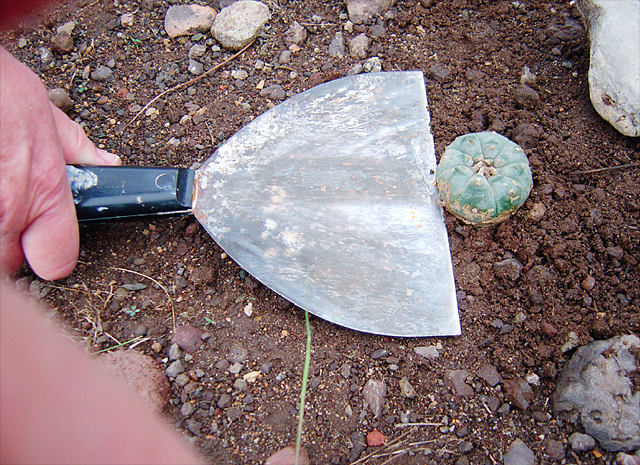 As more and more land is subjected to rootplows or is locked up, there is an ever-increasing pressure on those remaining populations of peyote that are legally accessible. 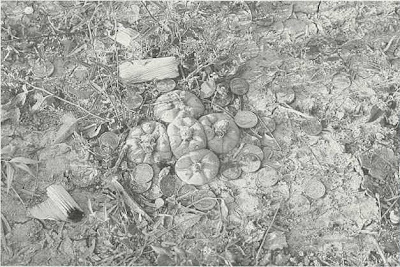 An area of peyote should not be recut for at least five years, but often peyoteros cannot wait that long if the demand for buttons is great. 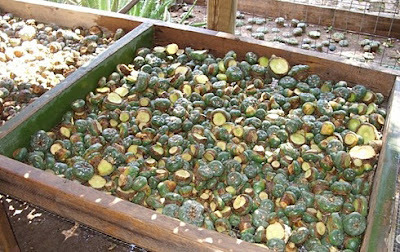 Thus, smaller and smaller tops are harvested (Fig. 12) at ever-higher prices. Fig. 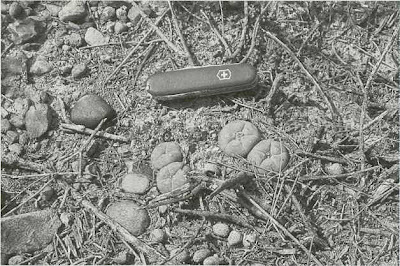 12 - Very small peyote "buttons," indicating that peyoteros are being forced to harvest regenerated tops before they have grown to a sufficient size. Photos by author. Financial support for this investigation was provided by the CSSA Research Fund. It is much appreciated. In addition, I wish to thank Dr. Stacy Schaefer of The University of Texas-Pan American for arranging travel, accommodations, and interviews in south Texas. I also want to thank Jerry Patchen for several valuable suggestions in the writing of this paper. Anderson, E. F. 1980. Peyote: the divine cactus. University of Arizona Press, Tucson. Morgan, G. R. 1976. Man, plant, and religion: peyote trade on the mustang plains of Texas. Ph.D. dissertation, University of Colorado. Morgan, G. R. 1983. The biogeography of peyote in south Texas. Bot. Mus. Leafl., Harvard Univ. 29:73-86. Morgan, G. R., and O. C. Stewart. 1984. 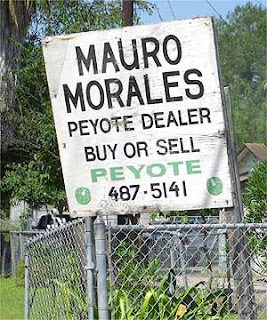 Peyote trade in south Texas. Southwest. Hist. Quart. 87:269-296. Stewart, O. C. 1989. The peyote religion: a history. University of Oklahoma Press, Norman. 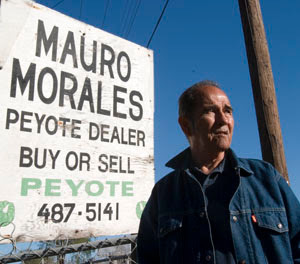 Salvador Johnson is one of four licensed peyote distributors left in the United States. He has harvested the plant for 47 years. MIRANDO CITY, Texas — In the heart of Rio Grande brush country, Salvador Johnson works a patch of land just east of the Mexican border that is sacred to Native Americans. One of the last remaining “peyoteros,” Johnson, 58, has been harvesting the small round plant in and around this tiny community for 47 years — long before the hallucinogenic Lophophora williamsii cactus was classified as a narcotic and outlawed by federal and state governments. Then as now, it is for use by Native Americans as the main sacrament in their religious ceremonies. Johnson is part of a nearly extinct trade of licensed peyote harvesters and distributors, at a time when the supply of the cactus and access to it is dwindling. The plant grows wild only in portions of four southern Texas counties and in the northern Mexico desert just across the Rio Grande. But some Texas ranch owners have stopped leasing land to peyoteros and now offer their property to deer hunters or oil and gas companies for considerably higher profits. Others have plowed under peyote, and still others have never opened their land. On the ranchland that is worked by peyoteros, conservationists are concerned about the overharvesting of immature plants as the Native American population and demand for the cactus grows. “Will there be peyote for my children and my children’s children?” asked Adam Nez, 35, a Navajo who had driven 26 hours with his father-in-law from their reservation in Page, Ariz., to stock up on peyote at Johnson’s home. That question and possible solutions to the problem — such as trying to legalize the importation of peyote from Mexico, and creating legal cultivation centers in the United States — are being studied by members of the Native American Church, Indian rights advocates and conservationists. There are an estimated 200,000 to 500,000 members of the church in the United States. Although 90 percent of the peyote in North America grows in Mexico, the number of ceremonial users there — mostly Huichol Indians — is a small fraction of the number in the United States and Canada. “In effect, you have a whole continent grazing on little pieces of south Texas,” said Martin Terry, a botany professor at Sul Ross State University in Alpine, Texas, who specializes in the study of peyote. The church was incorporated in 1918 in Oklahoma to protect the religious use of peyote by indigenous Americans. Its charter was eventually expanded to other states, and in 1965, a federal regulation was approved to protect the ceremonial use of peyote by Indians. In 1978, Congress passed the American Indian Religious Freedom Act. The law extends protection against prosecution for the possession and use of peyote only to members of federally recognized tribes. “Over the last 40 years, there have been lots of equal-protection defenses to criminal prosecution thrown up, with people saying ‘my use of this controlled substance is religiously derived,’ ” said Steve Moore, a senior staff attorney with the Native American Rights Fund. Though not considered addictive, peyote is included in the Drug Enforcement Agency’s list of Schedule I controlled substances along with heroin, lysergic acid diethylamide (LSD), marijuana and methaqualone. Although the DEA acknowledges the importance of the hallucinogenic cactus to the religious rites of Native American peyote users, the agency says the drug has a high potential for abuse and has no accepted medicinal purpose in the United States. 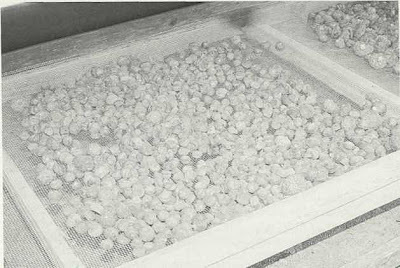 The Texas Department of Public Safety has licensed peyote distributors since the mid-1970s, when the number in the state peaked at 27. It dwindled to four last year. State records show that only three distributors have harvested and sold peyote so far this year. For the past five years, an average of almost 1.9 million peyote buttons have been sold annually, according to state records. Lophophora williamsii (peyote) populations have diminished in large areas of South Texas where peyoteros harvest the cactus for ceremonial use by the Native American Church. Habitat destruction caused by urban development, rootplowing, etc., account for much of the reduction, but the regulated commercial harvest of peyote is also taking its toll. Some harvesters cut the peyote too low (it can be very hard to tell where the shoot ends and the root begin) - consequently many of the decapitated plants will not regenerate new stems and are left to die. To address this problem Martin Terry and James D. Mauseth have investigated the proper technique for harvesting peyote, and found that the cactus must be cut off at or immediately below its base, leaving the subterranean portion of the plant (including all or most of the subterranean part of the stem) in the ground to regenerate new crowns. Their harvesting technique is outlined below. Plant about to be cut transversely at the base of the crown (the photosynthetic part of the stem), i.e., at ground level. 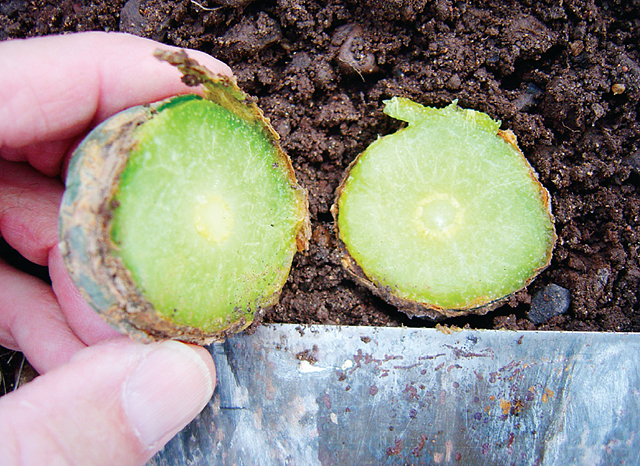 Cut has been made parallel to the ground surface, and the harvested crown (below) has been removed from the subterranean portion of the stem (above, remaining in the ground). The cut surface shows a cross section of the vascular cylinder (ring of yellow tissue near center of stem), the pith within the vascular cylinder, and the yellowish green parenchymal tissue of the cortex of the stem (between vascular ring and epidermis). The underside of the harvested crown (left) shows a very narrow (2–3 mm wide) ring of bark at the perimeter of the cut surface, indicating that the cut was barely below the base of the crown, in the uppermost portion of subterranean stem. The cut surfaces match, except that crown parenchyma (left) is slightly greener due to higher chlorophyll content, whereas the subterranean stem parenchyma (right) is more yellowish. 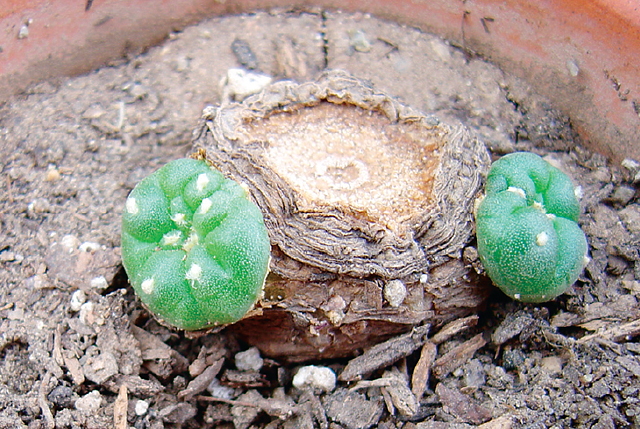 Two young peyote crowns (“pups”) regenerating by lateral branching from the upper edge of the subterranean stem of a plant that was decapitated 7.5 months previously. This plant is the same individual shown in the 3 previous pictures. Each of the new crowns is ca. 1.5 cm in diameter. If the peyote is cut too deep no tubercles are left to sprout and continue growing after the top has been removed, i.e. the closer to soil level the plant is cut, the greater the chances are that the remaining parts of the plant will retain healthy tubercles and be able to re-grow new crowns. Terry and Mauseth base their technique on detailed studies of the anatomy of root, shoot and hypocotyl (region between shoot and root) and also give recommendations on how to distinguish shoots from roots without actually cutting the plant open. 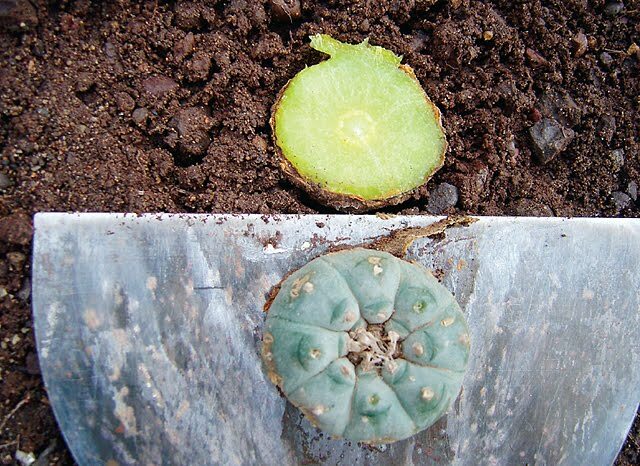 See also How to sustainably harvest Lophophora williamsii (Peyote) from Kadas Garden.